As someone who was never really interested in Pokémon as a child, Pokémon Go has become a surprisingly big part of my life since it launched back in July. Though I initially joined so I wouldn’t be the only one of my friends not playing, I ended up loving the game and have become one of the more intense players in my group of friends. In some ways the game is like a scavenger hunt on your cell phone, and that’s something that drew me in from the beginning. Despite its flaws, Pokémon Go is a game that I not only enjoy playing, but one that has also impacted my life in many unexpected ways. One of the biggest benefits of playing Pokémon Go is that it has helped me become more active. Though I’m on my feet for most of the day because of my job, when I get home, I tend to sit around and relax and not do much. On my days off, if I’m not running errands, I’m really not doing much at all. My roommate and I used to go for walks together around our neighborhood last summer, but as summer became fall and then winter, we kind of gave up on that routine. Once we started playing Pokémon Go, though, we’ve started taking nightly “Poké Walks” around our neighborhood to try to find Pokémon. With our old walks, we’d be out for a half hour or so, but during our Poké Walks, which last anywhere from 1 to 3 hours, the time just flies by when we’re out searching for rare Pokémon. Even on my breaks at work, when I’d normally be sitting inside checking social media or reading, I now go out and walk around the block to hit up Poké Stops and see what Pokémon I can find. Even though it’s just a game, it has helped me live a more active lifestyle since it came out. 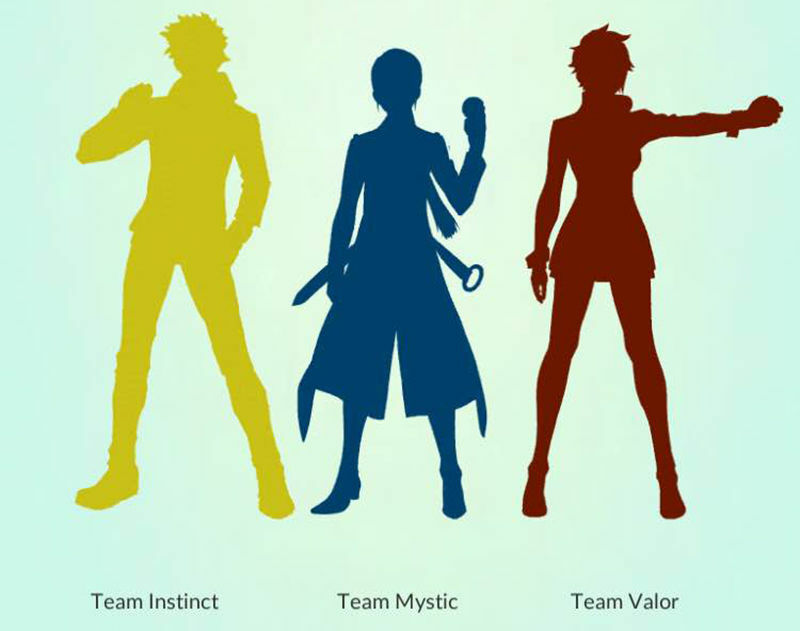 Are you Team Instinct, Team Mystic, or Team Valor? Image Credit: Niantic, Inc.
Pokémon Go has also helped me more easily meet new people. When the game first came out, there was a really interesting dynamic among the people who played it. Everyone was very social, helping each other find Pokémon in the area and asking which team they belonged to (Team Mystic, obviously). Though that dynamic has somewhat disappeared the longer the game has been out, in the early weeks it was very easy to meet new people and make new friends while playing the game. Pokémon Go was originally a very social game, but as more people have given up the game, there are less people to socialize with. Those who still play are somewhat social with each other, though it’s not quite the same. However, playing Pokémon Go has helped me get to know my new co-workers. I recently switched jobs and didn’t really know anyone who worked there. But many of them play Pokémon Go, and once they found out I played, it was like an instant ice breaker. I even got invited to go out with some of them after work to go find Pokémon on my third day of work. Though I would have gotten to know them eventually, I’m very thankful that this game gave me a way to relate to my new co-workers more quickly than if we didn’t have this game in common. For me personally, this game has helped me relate to some of my friends in a way I haven’t been able to in awhile. My friends are all big video game players, but I’m not as much. They all played Pokémon growing up, but since I didn’t, I wasn’t able to relate to them with that until now. Because of Pokémon Go, I now have a familiarity with it that I didn’t have before, and it has become something fun that we can all share. It’s also a game I’m “good at”, so to speak, since there isn’t much skill involved, whereas most other video games I’m quite bad at. It’s nice for me to be on an equal playing field with most of my friends for once. Pokémon Go is one of the first mobile game fads that I’ve enjoyed in a long time. I was never one for Candy Crush or Angry Birds, though it seemed like everyone else was. It’s not a perfect game, but I have a lot of fun playing it and sharing in the experience with lots of different people in my life and with the strangers I’ve met while playing. When I started playing Pokémon Go, I didn’t expect it to have as big an impact on my life as it did. I’m glad I downloaded the game because I can’t ignore the positive impact it’s had on my life. Do you play Pokémon Go? Share your comments on the game and which team you’re on in the comments! I am on team Valor!